Taking the right approach to telecom transformation. Transforming telecom networks has been the goal for more than a decade, and it has yet to be achieved to make the future of telecom work. Perhaps, according to President of CIMI Corporation Tom Nolle, because the industry has seized on a few technologies like SDN or NFV, and believes that adopting them will fix everything—which is unfortunately untrue. 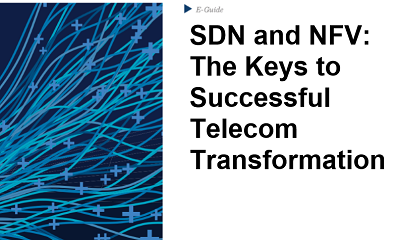 Download this eGuide to learn from Nolle on the future of telecom, NFV and SDN and how they can help generate new services revenue and lower operating costs using cloud principles—rather than a traditional network standards approach.